The magical misty Isle of Skye off the west coast of Scotland is a walkers' paradise. The peaks of the Cuillin provide the ultimate challenge for climbers while less demanding but equally satisfying expeditions can be found on a myriad of smaller tops and through the glens that skirt the majestic mountains. The Black Cuillin is a honeypot for walkers - 11 Munros strung out along a knife-edge ridge where climbers must contend with sheer drops, frightening levels of exposure and magnetic rock which can send your compass needle into a spin. Add to that Skye's famously inclement weather and its an undertaking for only the very experienced. But the Cuillin ridge is by no means Skye's only walking country. There are plenty of other options to suit all levels of fitness and experience. Away from the main ridge, Skye's only other Munro is Bla Bheinn above Loch Slapin. It makes an excellent day's hill walking for the reasonably experienced with some scrambling an option on either the ascent or descent. Aswell as the Black Cuillin, Skye has a Red Cuillin - a pocket of round scree-covered granite hills to the east of Glen Sligachan with two of the four tops easily conquered by the competent hillwalker. The other pair require some scrambling over steep slopes. The following is a selection of fine Skye walks ranging in length from an afternoon stroll to a weekend backpack. The routes described can be found on OS Landranger sheets 23 (North Skye) and 32 (South Skye). The Raasay walk is on both sheets 32 and 24 (Raasay, Applecross & Loch Torridon). A coastal path from the tiny community of Elgol on Loch Scavaig leads into the dark shadow of the Cuillin with breathtaking views to the islands of Soay, Rhum and Canna along the way. Leave the public car park at Elgol (grid ref 519137) and climb up the A881 road to a signpost for 'Garsbheinn'. Here a track leaves the tarmac on the left and passes by three houses before striking a course over open grazing land high above the swirling sea. On a good clear day the views are excellent with the craggy peaks of the Cuillin directly ahead and Soay immediately west. Rhum can be seen to the south and the flat form of Canna lies in the distance. The path heads north, dropping to a beach at the mouth of Glen Scaladal before rising up on to cliffs where the drop to the lapping waves of Loch Scavaig is much steeper. You emerge over a grassy field to the sweeping sandy beach at Camasunary, a remote and idyllic spot with the bulk of Bla Bheinn as backdrop. At the east end of the beach a track crosses a bridge then climbs over the hillside to Kilmarie on the A881 two miles on. From there follow the road south to Elgol. Old hill tracks between the crofting communities of Luib and Torrin provide a pleasant 11 mile coast to coast circuit linking sea lochs on the north and south side of Skye. In Luib (grid ref 564277), close by the folk museum, a bridge taking the minor road over the burn from Loch nam Madadh Uisge as it makes its way to Loch Ainort. A grassy track strikes off to the left of this, rising up behind the tiny community to run over the open moorland round to Strollamus. Two miles from Luib the track drops to a bridge over the Allt Strollamus. Just before it spanss the water, an obvious path branches off to the right, crossing a small burn to climb over the heather. It rises through An Slugan and from the watershed descends by Strath Beag to Torrin, meeting the A881 by an old white church building now converted into a house. Follow the road north along the shore of Loch Slapin with Bla Bheinn across the water. Pass by a small marble quarry and just before the road crosses a bridge at the head of the sea loch, a track branches off to the right, leading to Loch na Sguabaidh. The way continues through Strath Mor to Lochain Stratha Mhoir and from there a path skirts round the hillside, dropping down to Luib to emerge on to the road by the bridge. The striking rock formations of the Trotternish Ridge stretch north from Portree and can be followed all the way to Rubha Hunish on the northern tip of Skye. The route makes an excellent backpacking adventure. I covered it in two days and an evening, camping on the ridge along the way. You can set off from Achachork (grid ref 479461) two miles north of Portree or climb on to the ridge from Loch Fada (grid ref 491492) a little further up the road to Staffin. Either way, the first summit you encounter is A'Chorra-bheinn, a baby of a hill at only 459 metres high. The walk throughout is over a carpet of tussocky grass, heather and boulders and in places there is a path while elsewhere sheep tracks go in the right direction. Navigation is easy in clear weather but in mist care should be taken when route finding as the cliffs and crags can conspire against the unwary. The Storr at 719 metres is the highest point on the ridge and below it is the Old Man of Storr, a 50 metre pinnacle of rock and decomposing basalt. First climbed in 1955, it is a spectacular yet fragile sight. From The Storr north there are impressive sea views and Beinn Edra is the next major top, a fairly demanding climb leading to the stony summit. More geological wonders await after the ridge walk drops to cross the single track Staffin to Uig road. Beyond this a narrow path skirts below the cliffs to a rocky pass called the Quiraing where a pinnacle of rock called the Needle is to be found below The Table, a perfectly flat grassy plateau. To continue the ridge walk, you must return to the road and head over Meall na Suiramach. Alternatively cut the route short and follow the path on from the Quiraing down to Flodigarry passing by Loch Hasco and Loch Laingaig which make fine pools for a swim on a hot summer day. You can enjoy spectacular views from the Trotternish Ridge without having to walk its entire length. One of the high points, Beinn Edra, can be climbed from Uig in north west Skye. Start out by the village newsagent shop (grid ref 398639) and follow a minor road up Glen Conon. Initially the way climbs steeply over several sharp curves but eases off to rise more gently past a string of crofting cottages. At the last house, cross a stile and a muddy track continues over open moorland used for cattle and sheep grazing. Ahead, to the right, spectacular waterfalls crash down into their own craggy amphitheatre of rock. A mile on and the track disappears, replaced by an indistinct path over marshy ground. This continues to a fence that cuts across the way. Follow this to the burn a few yards down to the right and walk upstream to reach the ridge. Once there, drink in the views east then turn right and climb to the summit of Beinn Edra where a trig point marks the top. Stunning panoramas stretch out all around and the view south over the ridge is particularly impressive. Gently sloping plains rise up from the west only to drop away over sheer cliffs to a rolling landscape of clear blue lochans and grassy slopes punctured by knife-edged spears of rock in the east. From the top, descend south down the Lon an t-Sratha burn to the end of a minor road at Balnaknock croft. The route then skirts down the south side of Glen Uig to emerge on to the main road. With two routes on to the ridge already described, here is one to explore the countryside below the crags. Walk into the shadow of the Trotternish Ridge on the trackbed of an old mineral railway once used to ferry ore between a quarry and a kiln and loading quay at Invertote Bay. Combined with a good track, it offers an easy six mile circuit. Set out from the layby at Lealt on the A855 (grid ref 516605) and follow the minor road up to Lealt, a small cluster of cottages. Head along the track as it follows the Lealt River upstream and continue to Loch Cuithir, the buttress of Sgurr a'Mhadaidh Ruaidh dominating the view ahead. From the loch, a popular spot with anglers, pick up the railway trackbed drops on a a steady decline, passing the remains of old stone bridges and rusty strips of rail en route. The line curves left to meet with the track at a 'cross roads'. On the other side the railway continues over the open moorland, following a fence before rising up behind the houses of Lealt. It joins the minor road just short of the layby. It is possible to climb down to Invertote Bay using a narrow path that starts from the main road on the south side of the Lealt River. The ruined kiln remains along with a dilapidated old fishing cottage and there is a spectacular waterfall just upsteam from this. The 2ft gauge railway was opened in 1890 but closed in 1915 when men from the quarry went away to war. 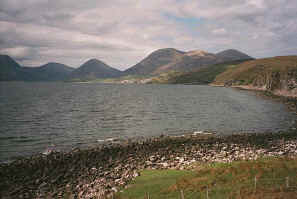 The island of Raasay is a short ferry hop from the Skye mainland. The tiny Caledonian MacBrayne boat MV Raasay provides a regular crossing from Sconser, daily except Sundays. A good walk can be had exploring the island's old iron mining industry. Set off from the pier (grid ref 555342), climbing up the trackbed of a disused mineral railway. This skirts to the left of ruined buildings associated with the mineral exploitation. The way climbs steeply at first past a huge concrete hopper before rising more gently over open moorland to the ruin of a stone motorhouse used to pull cable-hauled wagons up over the line. Across a fence the line of the railway continues along a break in the trees and a narrow path is easily followed to an old viaduct. Tall skinny concrete piers are all that remain now and the walker must descend into the valley the bridge once spanned, and climb out the other side. Further on, the line emerges at more ruins. Just beyond these the entrance to one of the two iron mines can be found, a curtain of dripping foliage all but concealing the tunnel. Beyond this a labyrinth of passageways extends into the ground but exploration is not advised. The mines were developed during the first years of this century and worked through World War One by German prisoners. Production ceased in 1919. For a good 12 mile circular walk, follow a path by the Inverarish Burn north from the buildings by the mine entrance over open moorland to the summit of Raasay's highest hill, Dun Caan, and Loch na Meilich in its shadow. Then descend north west on a good path to the road and follow this south, passing by the youth hostel, through Raasay Forest to Inverarish. A roadway skirts along the coast back to the pier. Isle of Raasay - A Guide to Island Walks & Forest Trails. Free leaflet published by Forest Enterprise and Raasay Social Services. Isle of Skye & Lochalsh - A Guide to Forest Walks & Trails. Free leaflet published by Forest Enterprise. Black Cuillin Ridge - Scrambers' Guide by S.P. Bull (Scottish Mountaineering Club). 200 Challenging Walks in Britain and Ireland by Richard Gilbert (Diadem Books). To reach Skye, travel to Kyle of Lochalsh (rail and bus services) and cross toll bridge. Alternatively take Caledonian MacBrayne ferry from Mallaig to Armadale or privately run ferry from Glenelg, 30m south of Kyle of Lochalsh, to Kylerhea. Caledonian MacBrayne ferry to Raasay sails six times a day from Sconser. No Sunday service. Scottish Citylink and Skyeways provide bus services from Glasgow to Skye, extending as far north as Uig. There are also local bus services. Mainland rail services extend as far as Kyle of Lochalsh and Mallaig. Car rental can be arranged through the garage in Broadford. Campsites at Glen Brittle, Portree (Torvaig), Uig, Dunvegan and at Raasay Outdoor Centre. SYHA hostels at Kyleakin, Broadford, Uig, Glenbrittle and Raasay. Wide range of hotels, bed and breakfasts and privately run hostels on Skye and there is a hotel on Raasay.